Fastbraces® is a revolution in orthodontics often halving the time it takes to straighten your teeth, you can now have Fastbraces® in Perth, Western Australia. Woodvale Park Dental is proud to be one of the first practices in Australia to offer this revolutionary technology. Traditional orthodontic braces move your teeth in two separate stages; first the crowns are moved into the correct place, normally taking around one year. The second phase is to move the roots into position; this can take a further twelve months. We are proud to be one the few providers of Fastbraces® in Australia; and one of only three practitioners of Fastbraces® in Perth. Fastbraces® work very differently, from the very first appointment; the braces start to move not only the crown of the teeth, but also the root simultaneously. This has two very distinct advantages, the first is the speed the alignment of the teeth is achieved, normally less than one year and in some cases just three months and because the movement of the teeth is achieved in such a short period of time, drastically reducing the threat of tooth decay due to improper oral hygiene. Whilst Fastbraces® is new to Perth as well as in Australia, the technology has been available in the United States for twenty years and have been successfully fitted to literally thousands of patients with extremely satisfying results. Extensive research has shown that Fastbraces® are as safe as traditional braces and many patients report much less discomfort. This is because the system uses a new modern technology and the use of one state of the art heat activated wire. No more torquing and bending wires. Patients have also reported less sensitivity than old style braces. Furthermore, the mechanism of movement means that less retention time is needed, it can be as little as twenty minutes per day which means no more uncomfortable nights wearing a retainer. Other “fast” systems only correct the teeth you can see – the front teeth. Fastbraces® corrects all the upper and lower teeth getting you into a stable bite. The Fastbraces® system can be fitted without extraction. If you have been advised to have extractions we can provide you with a Fastbraces® option and you can assess which best suits your needs and budget. Fastbraces® are also more affordable as they are fitted for much less time than traditional braces, this means less visits to the dentist, less time off school or work. Woodvale Park Dental is one of only a handful of dental practices to offer Fastbraces® in Australia. Just imagine being able to have your teeth straightened in half the time of normal orthodontics, right here in Perth. We have many patients who travel to see us on weekends just to use the latest Fastbraces® technology. Here are some of the benefits of Fastbraces® over traditional braces. 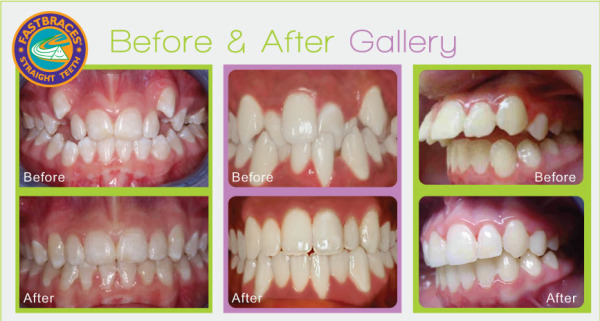 Speedily aligns teeth, within three months to 12 months, compared to 2 years or more with traditional braces. Ceramic braces available -Tooth coloured instead of metal. So if you live in Perth and would like to take up this unique and affordable opportunity to change your smile, but don’t want to wait up to two years then call us today on 9309 2339 for Fastbraces® in Perth.